With water comprising 73% of the brain and close to 60% of the average human body, there’s no better choice than plain water when it becomes time to rehydrate. Doctors and nutrition experts recommend plain water as the safest and healthiest choice. After all, it is calorie-free, caffeine-free, sugar-free, and should be free of most additives. But sometimes water can be plain, even dull. To spice things up, some people choose to augment their everyday water consumption with sparkling water. If regular water is boring, why not just add a bit of fizzyness to spice it up? However, there has been some recent media coverage suggesting that sparkling water may pose a threat to your teeth. 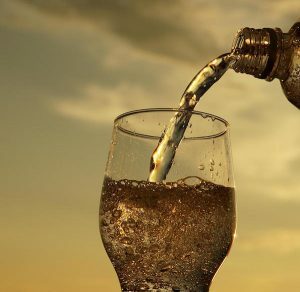 At The Glenroy Dental Group our single focus is on protecting your dental health, so we’d like to share with you our information on sparkling water, it’s safety, and how it compares to other drinks. Dr Edmond Hewlett, a professor at the University of California–Los Angeles School of Dentistry, reports that sparkling water breaks down in your mouth and becomes carbonic acid. The science of carbonated water can be explained in a chemical equation: CO2 + H2O -> H2CO3. After a drink is opened, the carbonic acid gradually breaks down into H2O and carbon dioxide (the bubbles) because picking up the bottle and opening it relieves the pressure and warms it up. But while cold and bubbly, sparkling water is more acidic than plain water. Natural water has a pH level of 7, which is very close to the optimal pH of the mouth, about 7.4. A lower pH means higher acidity. Fruit juices are between 3 and 5, while soft drinks range from 2 to 4. Sparkling water measures between 5 and 7. This is important to teeth because enamel, the hard, protective outer layer of the tooth, can dissolve in a pH level below 5.5. So, a lot of sparkling water is in the safe range, but some have slightly high acidity. A study published in the Journal of the American Dental Association showed that beverages like Gatorade and Powerade drinks to be “extremely erosive” or “simply erosive” while sparkling waters were “erosive” or “minimally erosive.” This sounds vaguely bad, but what does it really mean? Most science seems to find that carbonated water is not that bad for your teeth. Some studies conclude that carbonated water can damage teeth in theory, but others suggest it has little real effect. However, in that study, “the … (teeth) … were submerged in test solution for 15 minutes three times a day for 7 days.” This is a relatively unrealistic simulation of the mouth and how we drink. Dr Peter Alldritt of the Australian Dental Association reports that erosion is a gradual process and that saliva fights against erosion as it contains buffers and enzymes that neutralise acidity in the mouth. This returns the PH level of your mouth to healthy and safe levels. Regular water is always the recommended choice, but sparkling water is better than sodas or juices. Also, there are a few strategies to prevent even the risk of damage to your teeth. Drink unflavoured sparkling water. Flavoured sparkling water is usually supplemented with sugar, which by itself can damage your tooth enamel. Limes, lemons, and other citrus fruits have a high acidity level, which can increase the likelihood of enamel erosion. Take your drink with a meal. Don’t sip on sparkling water all day. Enjoy it during meals when saliva helps to neutralise and buffer the effects of acid. Brush only after 30-40 minutes. Brushing directly after drinking a carbonated beverage can make things worse, as the enamel is slightly weakened. At The Glenroy Dental Group, your health and happiness, and that of your loved ones, are our primary goals. We use the most modern technology available and take advantage of the latest dental techniques to ensure that your dental health and appearance are at the highest level. We want you to receive the best possible dental care with no pain or anxiety! Exam, Scale & Clean for only $99!